The main purpose of the federal gift tax is to keep people from avoiding paying the federal estate tax by simply giving away all their money before they die. In 2018 the maximum federal gift tax rate is 40%. There is an annual exclusion, which in 2018 allows you to gift up to $15,000 per year per person without triggering the gift tax. In addition to the annual exclusions, there is a lifetime tax-free exclusion that covers gifts above and beyond the annual exclusions up to $11.20 million. As a resident of Connecticut, you are also subject to a state gift tax that ranges from 7.2% to 12%. Money to cover education tuition. Such gifts must be made directly to the educational institution, not the individual, and out-of-pocket expenses like books, supplies, and living expenses are not qualified expenses. It’s important to also note that payments into 529 state tuition plans are also considered gifts. However, a special rule can apply to permit a single one-time contribution to a 529 plan to be treated as if it were made over a five years period. So a single $75,000 contribution would not exceed the gift tax exemption provided you do not make any additional gifts to the benefiting individual in the following 4 years. Money for medical expenses. As with gifts for education, these must be paid directly to the person or institution providing care. Qualifying expenses include diagnosis and treatment of disease, medical and long-term care insurance, transportation that is primarily for medical care, and a number of medical procedures. Bona fide business transactions. If you buy an item and you had a valid business purpose for the purchase, it will not be considered a gift if you discover later on that you inadvertently paid more than fair market value for the item. Jointly owned bank or brokerage accounts or U.S. Savings bonds. It is not considered a gift at the time another name is added as a joint owner. However you WILL be treated as having made a gift at the time that joint owner withdraws funds later on. “Present-interest” gifts up to the amounts specified by the annual exclusions noted above. As you can probably see, there are a number of ways to maximize gifts without triggering the gift tax. For instance, if you wanted to help a friend or family member pay for a college education—including some of the individual’s living expenses—you could gift a sum of money directly to the college to help cover tuition (in any amount, as long as it doesn’t put you over the $11.2 million lifetime limit), and then gift another sum (up to $15,000 annually) directly to your friend or family member to help cover whatever living or other expenses that person had. That’s just one example; there are many other scenarios to explore when you’re considering gifting money. If you want to provide some financial support to someone, or to reduce your taxable estate by moving assets out of your name, we can help. Just give us a call and we’ll be happy to walk you through your options. This is the first in a three-part series about the gift tax. 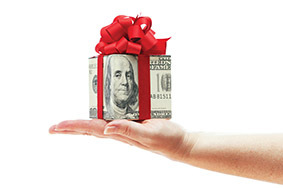 Read part 2 about which kinds of gifts are subject to the gift tax.